Shot blockers alter the momentum of the game with their swats. The iconic image of Dikembe Mutombo waving his finger in the face of the player he just blocked comes to mind. Although we don’t have that anymore, there are plenty of high fliers who routinely swat balls into the stands. And a few manage to do it even without a supreme vertical. 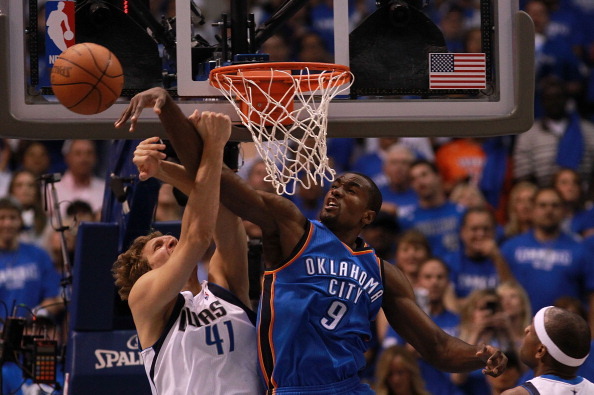 Ibaka is the best shotblocker in the league by a sizable margin. Of the top 7 players in this list, Ibaka actually plays the fewest minutes. Although if one went by blocks per 48 minutes, Javale McGee would average 5.26 to Ibaka’s 4.67. But McGee only plays 18.1 minutes per game. Going by blocks per 48 minutes, Sanders would average 4.98. That would put him in second place behind McGee. Sanders played 27.3 minutes per game this season for the Bucks. His ratio of blocks per foul, 0.86 is also better then Ibaka’s 1.14. Tim Duncan is 36 years old, has barely any vertical to speak of, and yet he is third on this list. Proving that timing, technique and defensive awareness are equally important as athleticism when it comes to shot blocking. The giant 7″2 center of the Pacers is a towering, imposing defensive presence and is the linchpin for the incredible defence of the Pacers. His height enables him to swat away shots with abandon. Prior to his back injury, Howard would have been in the top two on this list for certain. Although his vertical has suffered, he is still among the most elite interior defenders in the league today. He has the lowest blocks per fouls ratio in the league with 0.64. Without Derrick Rose, the defence of the Bulls is one of the major reasons they are in the playoffs. Coach Thibodeau is a defensive mastermind, and utilizes his big man to a great extent. Noah is one of the most energetic defenders in the league today and his shot-blocking is an intimidating part of the jaws of the Bulls’ defence. Brook Lopez has often been criticized for not rebounding at an excellent rate. But his shot-blocking is quite impressive, given that he got 152 blocks in 74 games this season. How deep the Nets go in the playoffs will depend on the interior defence manned by Lopez. Hands down, the best shot blocker in the NBA. But he doesn’t get much playing time to lead the league in blocks. While he gets more than his share of criticism for making absent-minded plays, he alters an ungodly number of shots on defence. Josh Smith is one of the most athletic wings in the league and of all the players in this list he may be the fastest. He got 157 blocks this season. A tie at the 10th place. Biyombo is only 20 years old and is quite impressive on defence already. He got 143 blocks this season.